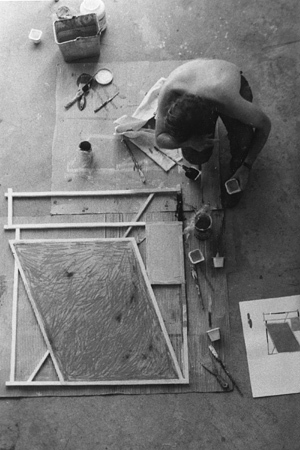 I’m ready to report that the gallery, in partnership with the Estate of Craig Kauffman, is in the midst of publishing a monograph on Craig’s life and work. With a 25,000 word essay by Hunter Drohojowska-Philp and more than 150 full-color reproductions, Sensual Mechanical: The Art of Craig Kauffman will be a truly remarkable book. For me, it represents an important opportunity to set the record straight about Craig, and draw the attention of a wider audience to his innovative and exciting work. This monograph has been a labor of love from the beginning, and is a tribute to Craig. Now, having worked with a team of experts for nearly two years, I am happy to announce that the work is almost completed. Sensual Mechanical: The Art of Craig Kauffman is on track to be published in September of this year, just a few short months away. It’s my hope that this book will encourage historians, critics, and art enthusiasts to take a closer look at Craig’s prodigious body of work, created over his long and fruitful career. Keep your eyes peeled for more information about Sensual Mechanical: The Art of Craig Kauffman, as it is coming soon! Something that might not be evident about any art exhibit is just how many people are involved. Every exhibition and publication requires the talents of a diverse group of people, who write, edit, design, curate, install, photograph, coordinate….I could go on and on! Recently, I had the opportunity for a major collaboration with my good friends and colleagues, Mary MacNaughton and Kirk Delman. 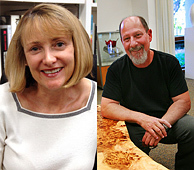 As you may remember, Scripps College hosted Clay’s Tectonic Shift: John Mason, Ken Price, and Peter Voulkos, 1956–1968 this past spring, and I was happy to have worked with Mary and Kirk over the course of many months to help make the exhibition possible. Scripps, in association with the Getty, was therefore able to make its own unique contribution to Pacific Standard Time: Art in L.A. 1945-1980. For those of you who aren’t familiar with Mary, she is the Director of the Ruth Chandler Williamson Gallery, as well as an associate professor of art history at Scripps. Kirk is the Registrar and Collections Manager of the Scripps College art collections, and works closely with Mary to design and coordinate their installations. The two of them are true professionals, and their expertise and enthusiasm made working together on this project a real pleasure. I am always happy when the work that I do brings me in contact with such great people, who share with me their creativity, knowledge, and passion for art. It’s part of why I got into this business in the first place – there’s nothing better than being a part of a supportive arts community. I am happy to share with you a new video featuring Scot Heywood and his show, Polarities, shot and produced by Ollie Bell. Scot met up with Ollie at the June 16th opening, where they decided to put something together to document the show. 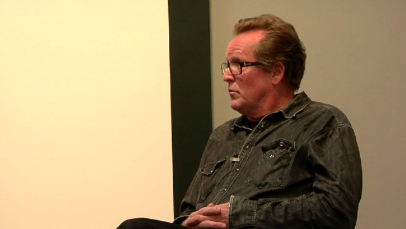 It was a pleasure to shoot here at the gallery, and an even greater pleasure to listen to Scot talk about his work. In the video, you’ll hear from Scot about his roots in abstract expressionism, and how abstraction has always been central to his artistic practice. He also talks about his restrained aesthetic, and habit of investigating a single idea for several years before making a subtle but significant breakthrough. This is the fourth video that Ollie has produced for us at the gallery, and it is as good as ever. His familiarity with the artists and their work always makes for a comfortable and fun atmosphere, and his work makes the art shine. 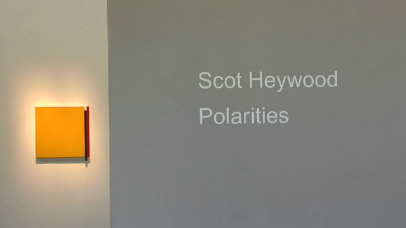 I hope you’ll enjoy this video as much as I do, and don’t forget to stop by and see Scot’s work in person; his show Polarities runs until July 7th. For some folks, as the song goes, “the livin’ is easy.” But around the gallery, things are jumping. We’re busy making videos, showing paintings, and looking forward to our summer show of Jennifer Lee. One of the biggest accomplishments of the gallery has been the presentation of artists from other countries. We’ve brought Goro Suzuki, Sugimoto Sadmitsu and Satoru Hoshino from Japan. Our two shows of Georges Jeanclos from France were momentous and we’ve presented Gustavo Pérez (Mexico) many times, as well as Wouter Dam (Holland). In just two weeks, we’ll have another exhibit of the timeless work of Scottish-born Jennifer Lee. 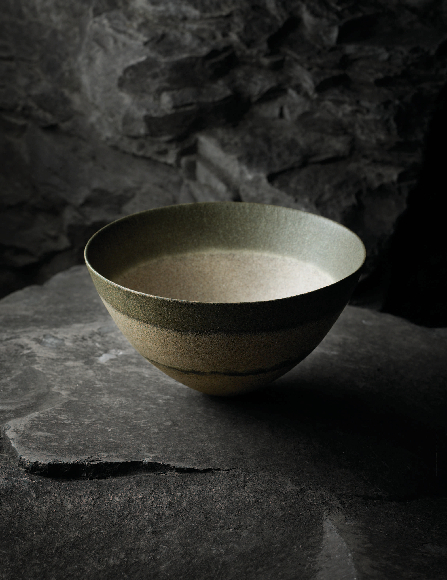 Jennifer lives and works in London, but her vessels demonstrate a truly global influence. 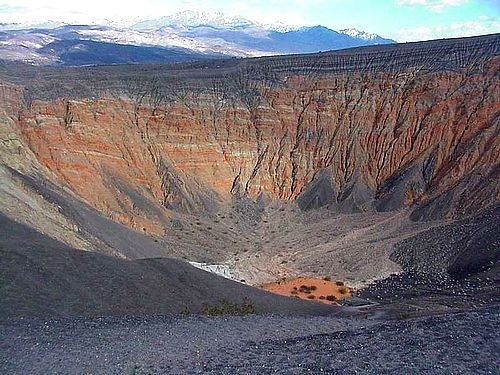 Her work is often compared to the sort of geological strata and rock formations that characterize deserts, a far cry from her green and misty home. While at the Edinburgh College of Art, Jennifer spent several months researching the ceramics of Native Americans in the south-western United States, and she has since traveled to Egypt, India, Australia and Japan as well as Europe and the USA. These experiences lend an international quality to her work, which we are happy to bring to Los Angeles to share with you. The exhibition Jennifer Lee: New Work opens Saturday, July 14th and runs through August 11th. Jennifer will join us for a reception from 5:00 pm to 7:00 pm on opening night, and we hope you will too! Falls the Shadow, Jennifer Lee is a new book featuring the work of Scottish artist Jennifer Lee, and was published to coincide with the exhibition the nature of things: Jennifer Lee, Hans Stofer and Laura Ellen Bacon at the New Art Centre, Roche Court Sculpture Garden, Wiltshire. 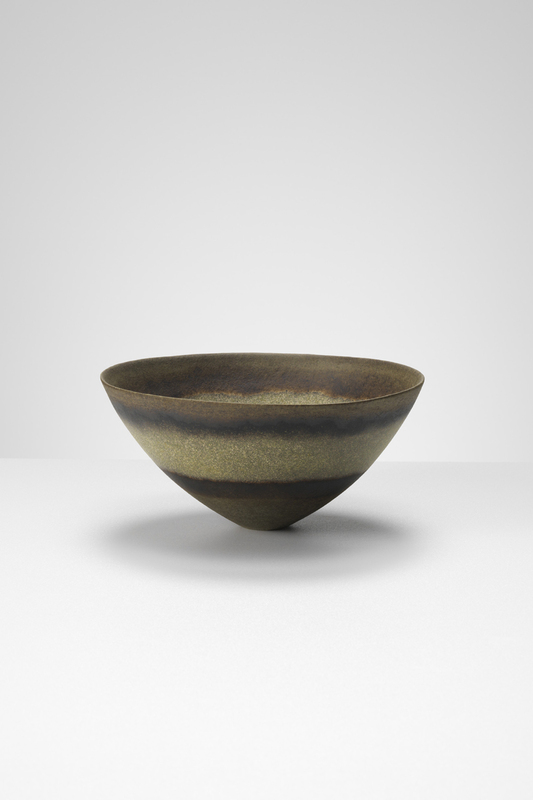 The book is wonderful, with texts by award-winning authors Tanya Harrod and Edmund de Waal, and superb reproductions of her pots, drawings, and their installations. It also includes an intimate collection of images of her materials, sketchbooks, and studio. It is easy to see the connection drawn here between poem and pots, as Jennifer’s works seem suspended in both time and place. They are poised on the very edge of action and motion, remaining utterly still on their pedestals. Edmund de Waal writes that one of the best descriptions of sculpture is that it “displaces the air around it, creating a sort of spatial hum,” and he believes that Jennifer’s work possesses this quality. This hum, or vibration in the atmosphere, occupies the same space as the shadow of Eliot’s poem. Jennifer’s vessels are imbued with the activity of their creation, resulting in finely balanced forms that evoke geological processes in their colors and proportions. I am happy to be welcoming Jennifer back to the gallery this summer for her show Jennifer Lee: New Work from July 14th to August 11th. We will have copies of this beautiful book of her work available to purchase.